In this article, different approach using a light-sensitized enzymatic(LSE) system has been proposed. The LSE is a way of producing hydrogen by coupling an inorganic semiconductor with enzymes in a photoelectrochemical configuration. The system uses the intrinsic proton reduction ability of hydrogenase enzyme in tandem with an anodic compartment where the electron donors like water undergo oxidative reaction on light-sensitized photoanode. Generated electrons are separated and moved through an external circuit within a solar cell, which is applied for an external bias, to the cathodic compartment and used for the reduction of proton into hydrogen on the active sites of enzymes. Oxidized ions move to the cathodic compartment through an ion bridge like nanofiltration(NF) membrane in this study. Environmental remediation by photocatalysis has been an attractive issue over the last decade, while recently numerous studies have focused on hydrogen evolution from water as a clean energy resource since the invention of photochemical water splitting over TiO2 electrode in 1972. However, the photocatalytic process has been simultaneously criticized as being uneconomical compared to other oxidative treatment systems and up-to-date hydrogen production systems due to its inherently low efficiency and limitations resulting from the necessity for a novel material, an appropriate light source and immobilization, which may increase the overall energy costs. Therefore, research attention has focused on developing economically feasible photocatalytic systems with future commercial applications. Comprehensive reviews on semiconductor particulate systems, on TiO2 photocatalyst and on the material-related issues[4-5] for hydrogen production were published. Compared with other photocatalysts, TiO2 is much more promising as it is stable, non-corrosive, environmentally friendly, abundant and low cost ever since Fujishima and Honda claimed a total efficiency of solar energy conversion to hydrogen of only 0.4% using a TiO2 single crystal as photoanode and Pt as cathode involving a chemical bias imposed by pH difference between the electrodes[4-5]. Recently, photoanodes with TiO2-based film have been investigated using techniques like anodization[6-11] and sputtering. The aforementioned nanotube-film on titanium foil by anodization has been of our great interest for a system of light-sensitized enzymatic hydrogen production. 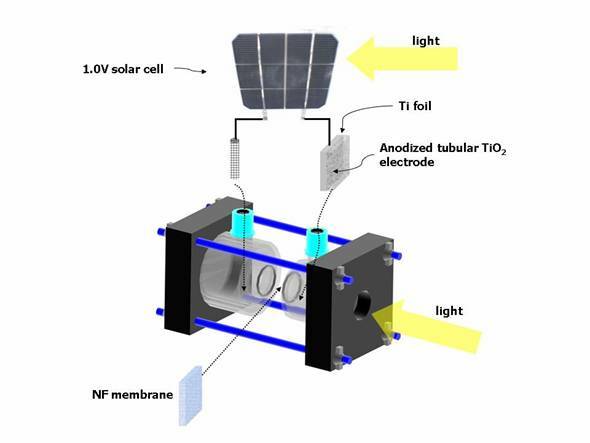 Our present work aims to give optimized system condition concerning photoanode of the anodized tubular TiO2 film on titanium substrate and proton-reducing enzymes to produce hydrogen, a renewable, nonpolluting and portable energy source. The trend of the system on the light-sensitized enzymatic splitting of water was then investigated. All chemicals were used without further purification. P25 TiO2(Degussa, FRG) was used as a reference when methylene blue(MB, 95% Showa chemical, Japan) was used as the probe compound for measuring photocatalytic activity of anodized tubular TiO2 electrode(ATTE). Titanium foils(0.25 mm thick, 99.6% purity, Goodfellow, England) were purchased and cut into pieces(2cm´2cm) for anodization. The anodization was performed at 20 and 30V for 1hr~17hr at room temperature or 5ºC with magnetic agitation, and then the samples were annealed in oxygen atmosphere(200 ml/min) at 350 ~ 850ºC for 1-5hr. Tubular or web-shaped TiO2 arrays were formed by anodization of the Ti plate in mixed solution(H3PO4 85% Junsei chemical, NaF 97% DC chemical, NaNO3 99% Junsei chemical) or in 0.5% Hydrofluoric acid with different pHs. 5% Hydrofluoric acid(HF 50% DC chemical) was also used for washing before the anodization when necessary. A 0.05M Tris-HCl buffer was also prepared and used as a cathodic electrolyte(Trizma base minimum 99.9% titration and 2N HCl, SIGMA). Purified hydrogenase(Pyrococcus furiosus, Pfu) was purchased from Prof. Adams at the University of Georgia. The activity assay of Pfu(21,834 unit/ml) was much higher than that of Clostridium butyricum(1,442 unit/ml) and Thiocapsa roseopersicina(1,704 unit/ml), as determined with Tris-HCl(50mM, pH 8.5, 50ºC, absorbance at 570 nm). 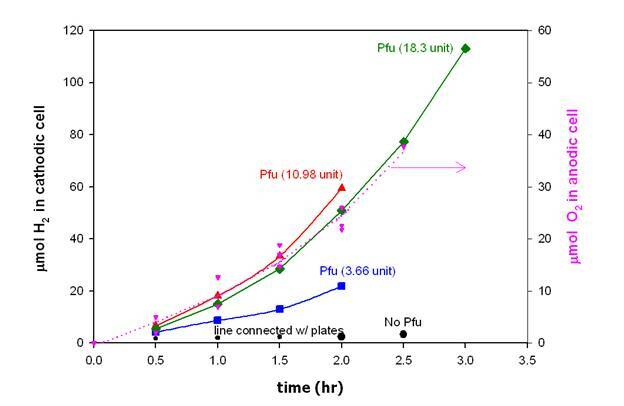 The specific activity(unit/mg, Bio-rad protein assay, absorbance at 750 nm) of Pfu was two to three times higher than that of the latter hydrogenases. One unit of hydrogenase activity catalyzes the production of 1 μmol of H2/min. Methyl viologen(MV) from SIGMA was used for an electron relay. Additional electrolytes such as Na2S, Na2SO3, 0.1M NaOH, 0.1M K2SO4, 1M KCl and seawater were used for comparison. Experiments were mainly conducted in a two-compartment(anodic and cathodic elements connected via a nanofiltration membrane, NF) reactor, as shown in Fig. 1. The anodic compartment had a volume of 80 ml(headspace volume ca. 55 ml) and was a cylindrical-shaped cell. The anodic compartment contains an aqueous solution of 1.0M KOH for water splitting unless otherwise noted. The cathodic compartment was a water-jacketed, cylindrical-shaped cell(80 ml, headspace volume ca. 55 ml) with Tris-HCl buffer sealed with a silicone rubber gasket. Prior to the reaction, the mixture was de-aerated with nitrogen gas for 20 min to remove the oxygen in water and headspace. Each of two terminals from a solar cell panel(10cm´10cm, crystalline silicon, max. 1.0V) was attached to the ATTE and the platinum mesh cathode to apply external bias into the system. The light source used was a 1000 W xenon lamp(Oriel, USA), which was filtered through a 10-cm IR water filter. Crystal phase and size were determined by X-ray diffraction(XRD, Miniflex, Rigaku; k=0.89, ramda=0.15418 for CuKa X-ray, 30 kV, 15 mA) and change in absorbance of characteristic MB was measured with UV/Vis(SCINCO, S-3150, Korea). The structure and morphology were investigated using scanning election microscopy(SEM/EDAX, Hitachi S-4700). Hydrogen and oxygen were analyzed by gas chromatograph with TCD(thermal conductivity detector at 260ºC, oven at 40ºC). The column used in the system was molecular sieve 5A(Supelco, USA). and NF membrane for hydrogen production. The prepared samples anodized in 0.5M H3PO4+0.14M NaF+0.1M NaNO3 have tubular(20V of bias, tube length ca. 600 nm) or web-shaped(30V, thickness ca. 618 nm) TiO2 film on the Ti substrates. The morphology of porous film was illustrated to change with electrolytes, concentration of electrolytes, pH of electrolytes, anodizing time and temperature, and the annealing ambient. This is due to the fact that during the anodization porous structures are formed through two processes: field-enhanced oxidation and field-enhanced oxide dissolution. And also, at elevated temperature solid-state sintering is likely to take place, which leads to grain growth, densification and complete collapse of the structure that are more remarkable during phase transformations. The phase transformations often accompany bond-breaking and enhanced mass transport[6-11]. XRD analysis of the selected samples indicated main characteristic anatase peaks at 2q=25.3 with that of the commercial P25 indicated as a reference when annealed at lower than 450ºC while rutile peaks at higher than 500ºC. Ratio of constituents(oxygen to titanium) of TiO2 film was calculated by EDAX results, which resulted in the range from 0.1 to 2.4. Photocatalytic activity of the ATTE was firstly checked with MB discoloration. The time-coursed profiles of MB discoloration with the samples along with P25 as a reference. Unlike P25, the samples revealed lower activity in MB discoloration irrespective of species, while lower dose of P25 showed similar profiles to the prepared samples. The Langmuir-Hinshelwood kinetics, generally applied in photocatalysis, indicates that a relatively high concentration of a probe material converts the equation to zero order kinetics, evidenced in our study by the simple experiment of varying the amount of P25 with a fixed initial concentration of MB(10 ppm) in order to change the time-coursed profiles of MB discoloration from first order to zero order with decreasing injection amount. The calculated amount of TiO2 on Ti substrate(2cm´2cm) turned out 1.6 ~ 3.1mg, assuming that film thickness is in the range of 1 ~ 2 μm and density of TiO2 is 3.9 g/cm3. This amount is about one tenth of P25(200mg initially). This is well correlated with the fact that less than 5 mg of P25 showed similar discoloration rate to the prepared samples. Effect of others electrolytes such as 1.0M KOH, 0.1M NaOH, seawater, 0.1M K2SO4 or 1M KCl on the amount of hydrogen was investigated, resulting in a rate of far less than 1 μmol/(hr´cm2). Figure 2. Time-coursed profile of enzymatic hydrogen evolution with the anodized tubular TiO2 photoanode(annealed at 550ºC, 1.0M KOH in anodic compartment, Tris-HCl buffer in cathodic compartment, irradiated photoanode area 1.0 cm2, ca. 68 mW/cm2 irradiation with Xe lamp). Thirdly, enzymatic hydrogen evolution in cathodic compartment with oxygen evolved in the anodic compartment was conducted with external bias(ca. 1.0V) applied by a solar cell. Previously, applied potential and its effect was examined with a potentiostat from -1.5V ~ +1.5V. Working electrode(WE) was placed on either the photoanode(P25 on ITO substrate) or the Pt cathode, while counter electrode(CE) was on the rest with reference electrode(RE), Ag/AgCl in saturated KCl. Then, external bias was applied onto the WE by potentiostat from -1.5 to +1.5V. Positive bias onto the photoanode or negative bias onto the Pt cathode generated respective negative current or positive current indicating an electron flow from the photoanode to the cathode for both cases. This upward shift of the anodic energy level led hydrogen evolution in the cathode compartment. Otherwise, completely opposite results were obtained without any hydrogen evolution. Noticeable hydrogen evolution was identified at a photocurrent above 300 μA when 1.3 V bias in absolute value was applied to the electrode. After the aforementioned check-ups, both a solar cell and a photoanode were irradiated to increase the Fermi level and to excite electrons in the VB into the CB of the photoanode. This system configuration led to the stoichiometric evolution of H2 and O2(H2:O2=2:1). Without any electron donor in the anodic compartment, oxygen was produced at a rate of ca. 15 μmol/(hr´cm2) and hydrogen was produced in the cathodic compartment at a rate of ca. 30 μmol/(hr´cm2). It revealed the rate of hydrogen production was ca. 30 μmol/(hr´cm2), which could be translated into ca. 6.75 L/(hr´m2). On a fine sunny day for 6.5 hrs in the area of 104 m2(100m´100m), 439,000 L of H2 could be evolved by rough calculation. Assuming that a fuel cell vehicle needs 4.6 kg of H2 for 395 km, 439,000L of H2 is for more than ten vehicles to be charged and for 3,352 km in distance. For hydrogen production with solar irradiation in the future, a relatively novel approach was described where sensitized photoanode donates electrons to hydrogenase that in turn reduces protons into hydrogen. Vertical standing nanotubes of TiO2 film was stably operating as a light sensitizer, evolving oxygen and enzymes were efficiently reducing protons into hydrogen. Practically feasible system configuration was also investigated replacing a salt bridge with nanofiltration membrane. To increase the amount of harvested light, longer TiO2 tube with optimum crystallinity has been under considered. This research was performed for the Hydrogen Energy R&D Center, one of the 21st Century Frontier R&D Programs, funded by the Ministry of Science and Technology of Korea. 1. G. B. Raupp, A. Alexiadis, M. Hossain, and R. Changrani, Catalysis Today, 69, 41 (2001). 2. M. Ashokkumar, “An overview on semiconductor particulate systems for photoreduction of hydrogen”, Int. J. Hydrogen Energy, 23(6), 427-438 (1998). 3. M. Ni, M.K.H. Leung, D.Y.C. Leung, and K. Sumathy, Renewable and Sustainable Energy Reviews, 11, 401 (2007). 4. T. Bak, J. Nowotny, M. Rekas, and C. C. Sorrell, Int. J. Hydrogen Energy, 27(1), 19 (2002). 5. T. Bak, J. Nowotny, M. Rekas, and C. C. Sorrell, Int. J. Hydrogen Energy, 27(2), 991 (2002). 6. D. Gong, C.A. Grimes, O.K. Varghese, W. Hu, R.S. Singh, Z. Chen, and E. C. Dickey, “Titanium oxide nanotube arrays prepared by anodic oxidation”, J. Mater. Res., 16(12), 3331-3334 (2001). 7. O.K. Varghese, D. Gong, M. Paulose, C.A. Grimes, and E. C. Dickey, “Crystallization and high-temperature structural thermal stability of titanium oxide nanotube arrays”, J. Mater. Res., 18(1), 156-165 (2003). 8. G. K. Mor, O. K. Vargheese, M. Paulose, N. Mukherjee, and C. A. Grimes, J. Mater. Res. 18, 2588-2591 (2003). 9. G. K. Mor, K. Shankar, M. Paulose, O. K. Vargheese, and C. A. Grimes, Nanoletters 5, 191-195 (2005). 10. M. Paulose, G. K. Mor, O. K. Vargheese, K. Shankar, and C. A. Grimes, J. Photochem. Photobiol. A:Chem. 178, 8-15 (2006). 11. K. S. Raja, V. K. Mahajan, and M. Misra, J. of Power Sources, 159, 1258-1265 (2006). 12. M. Kitano, M. Takeuchi, M. Matsuoka, J. M. Thomas, and M. Anpo, Catalysis Today 120, 133-138 (2007). 13. S.U.M. Khan and T. Sultana, Solar Energy Materials and Solar Cells 76, 211-221 (2003).